Greetings. 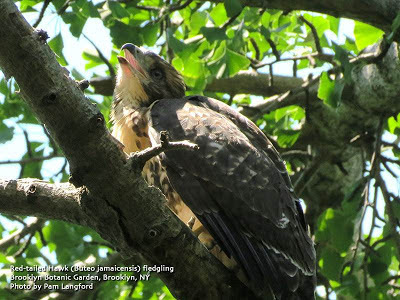 This is the New York Rare Bird Alert for Friday, June 28th 2013 at 7pm. The highlights of today's tape are MISSISSIPPI KITE, SANDWICH TERN, ARCTIC TERN, MANX SHEARWATER, RED-NECKED PHALAROPE, UPLAND SANDPIPER, YELLOW-THROATED WARBLER and BLUE GROSBEAK. We've seen no reports of the MISSISSIPPI KITE at the Cemetery of the Resurrection on Staten Island since Monday. The bird having become more sporadic up to that point but possibly still in the area but both adult and immature male BLUE GROSBEAKS were singing on the cemetery property on Tuesday. Most of last week's birding excitement took place in West Hampton Dunes on the south shore of Long Island on the flats on the north side of Cupsogue County Park ARCTIC TERN numbers were notably fewer than during the previous few weeks with just one first summer bird seen Saturday and Sunday. However on Saturday a full plumaged adult SANDWICH TERN paid a surprised but brief visit to the flats and the female RED-NECKED PHALAROPE first seen on Thursday the 20th on the spit at nearby Pike's Beach where it continued to Saturday was on the Cupsogue flats on Sunday and had been seen at both locations through today. Other birds on the flats last weekend included at least 4 different BLACK TERNS and several ROSEATE TERNS plus FORSTER'S, COMMON and LEAST TERNS and some BLACK SKIMMERS. Shorebirds at Cupsogue and Pike's where they're representing later and non-breeding northbound birds, early southbound migrants such as confused individuals, did include a few BLACK-BELLIED and SEMIPALMATED PLOVERS, about 3 dozen SHORT-BILLED DOWITCHERS, 15 plus RED KNOTS, small flocks of SANDERLING and SEMIPALMATED SANDPIPER, a few RUDDY TURNSTONES, a DUNLIN and a "Western" WILLET among the "Easterns". Offshore on Saturday at Cupsogue only a couple of CORY'S SHEARWATERS were noted joined by MANX SHEARWATER late in the day and spotted on the Cupsogue flats this morning were 2 SANDWICH TERNS as well as 3 BLACK TERNS and the RED-NECKED PHALAROPE. The singing YELLOW-THROATED WARBLER was still present near the entrance of Connetquot River State Park on Wednesday. This potential breeder should not be disturbed but do watch for nesting indications and pass them on if noted. This is a good time to find floaters locally these usually being unmated birds continuing to wander or birds disrupted in their nesting activities elsewhere that have begun to work their way back south. The UPLAND SANDPIPER found Sunday at the Edgemere Landfill in Queens presumably falls into this category as do several species of landbirds occurring at unexpected sites recently. "Although widespread and common in places, the Least Tern's favored nesting habitat is prized for human recreation, residential development, and alteration by water diversion, which interfere with successful nesting in many areas. It is classified as threatened, endangered, or as a species of concern for most states because of loss of nesting habitat. Interior population federally listed as endangered in 1985." In an apparent pair-bonding display, I watched this individual begging for food, then being fed by another adult. 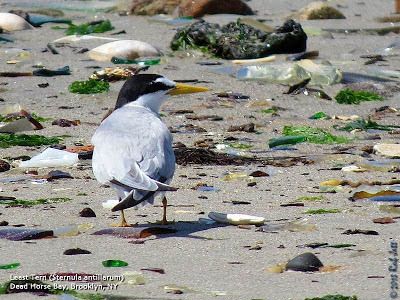 Here is a link to a New York State Department of Environmental Conservation page on the Least Tern. The following was just published in "BBC Nature News"
The plights of the world's threatened birds show the value of investing in conservation, according to campaigners. One in eight of the world's birds is currently considered threatened. A report by the Birdlife Partnership links continuing declines to deteriorating biodiversity, but it also highlights successfully protected species and habitats. Conservationists suggest this shows how the estimated $80bn (£50bn) price tag of conserving nature is worthwhile. Last year, scientists suggested it would cost about $5bn to reduce the extinction threat for all threatened wildlife, and up to $76bn to maintain a global network of protected areas. "The total sums may sound large, but they are small in terms of government budgets, and they should be seen as investments, not bills," said Dr Stuart Butchart, Birdlife's head of science. "Saving nature makes economic sense because of the payback in terms of services and benefits that people receive in return, from mitigating climate change to pollinating crops." Through the Birdlife Partnership, 116 conservation groups from around the world pooled their research to create the State of the World's Birds report. Birdlife first published an edition in 2004, when it called for urgent action to protect a third of the world's most threatened birds. A further update in 2008 identified that common species are declining as a result of habitat loss. The latest edition, launched in Ottawa, Canada, offers a complete overview of threats facing avian populations and the work being done to save them. Data concerning the status of threatened birds over the past 25 years has shown steady and continuing declines toward extinction, with Pacific species and ocean-going seabirds declining the fastest. Results from the publication also show that the biggest pressure on threatened birds comes from agriculture, followed by logging, invasive species and climate change. Conservationists say our familiarity with birds, from both modern and historical studies, offers a route to understand the trends and patterns in our environment more broadly. "Birds provide an accurate and easy-to-read environmental barometer that allows us to see clearly the pressures our current way of life are putting on the world's biodiversity," said Dr Leon Bennun, Birdlife's director of science, information and policy. Although the report warns of a "planet in peril", there are also positive messages in the collected case studies from partner organisations that show the extent and effectiveness of conservation efforts. For example, the UK-based RSPB and Birdlife International are working together to restore 100,000 hectares of Indonesian rainforest. Birdlife partners are also establishing projects globally to protect endangered birds such as the African penguin, spoon-billed sandpiper and Azores bullfinch. The report outlines six particular "success stories" - namely the Seychelles magpie robin, black robin, Mauritius parakeet, Rarotonga monarch, Asian crested ibis and Lear's macaw - where concerted efforts have brought species back from the brink of extinction. "Effective nature conservation is affordable and it works. It's time to make it happen," said Dr Bennun. The proportion of threatened bird species for which we have hard data to estimate population size and trends is tiny. This makes it difficult to prioritise scarce conservation funds - it's easier to make a list of threatened species than it is to identify and prioritise those facing the most immediate dangers. The world is full of "paper parks" - reserves that look good shaded green on maps, but which are utterly dysfunctional through lack of funds, staffing, or expertise. The importance of the connections Birdlife has been actively building between birds and communities cannot be underestimated. The actions of conservationists in cities, farms and schools in developing countries are just as important as how well we protect threatened birds in the world's Important Bird Areas. Saturdays, April 6 – June 29, 12 p.m.
Guide: Don Riepe - With Gateway National Recreation Area and NYC Audubon . Meet at the the Jamaica Bay NWR Visitor Center for a hike around the West Pond to look for mating horseshoe crabs and shorebirds. We'll also look for diamondback terrapins coming ashore to lay their eggs. Bring boots and binoculars. To register, contact Don Riepe at 917-371-8577 or donriepe@gmail.com. Guide: Don Riepe With Gateway National Recreation Area With Meet at the the Jamaica Bay NWR Visitor Center for a hike around the West Pond to look for mating horseshoe crabs and shorebirds. We'll also look for diamondback terrapins coming ashore to lay their eggs. Bring boots and binoculars. To register, contact Don Riepe at 718-318-9344 or donriepe@gmail.com. Sundays, June 2 through August 11 South Street Seaport, Pier 17 7–8:30pm (Brother Islands; Hoffman and Swinburne Islands) 6-9pm (Jamaica Bay) Guide: Gabriel Willow With New York Water Taxi Meet at South Street Seaport's Pier 17. This summer we will once again be exploring the City's island rookeries with three different itineraries! Depending on which weekend you choose, cruises may visit the fascinating Brother Islands, the large egret and cormorant colonies on Hoffman and Swinburne Islands, or the great expanses of Jamaica Bay. Whichever your destination, you'll experience the wonders of New York's famous harbor at sunset and see some of the three thousand herons, egrets, and ibis nesting on these urban island treasures. Specific cruise dates and registration will be available soon. Limited to 90. Breeding Bicknell's Thrush and Blackpoll Warbler will highlight a specialized habitat not too far away. We will be able to take the chair-lift most of the way, followed by hiking the rest of the way to the appropriate habitat. Join the team to count butterflies across Staten Island. Bring binoculars, comfortable shoes and lunch. Meet in the West Parking Lot at Snug Harbor. For more information call Ed Johnson at 718.483.7110. 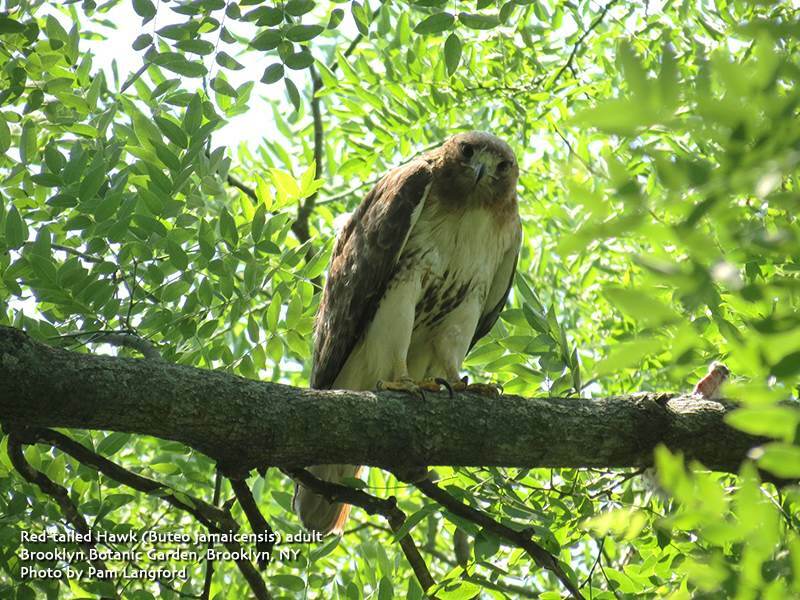 Bird Walks focus on wildlife happenings in the park and are led by NYC Audubon experts or the Urban Park Rangers. Greetings. 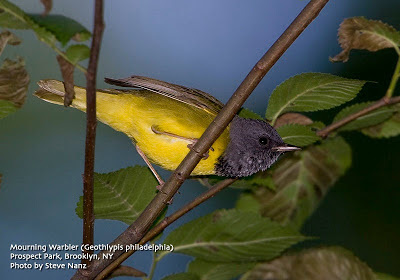 This is the New York Rare Bird Alert for Friday, June 21st, at 7:00pm. The highlights of today's report are SWALLOW-TAILED KITE, MISSISSIPPI KITE, BLACK-NECKED STILT, AMERICAN WHITE PELICAN, LEACH'S STORM-PETREL, ARCTIC TERN, GULL-BILLED TERN, RED-NECKED PHALAROPE, YELLOW-THROATED WARBLER, and BLUE GROSBEAK. Please note that our phone service has been interrupted, but we hope to have it back operating soon. 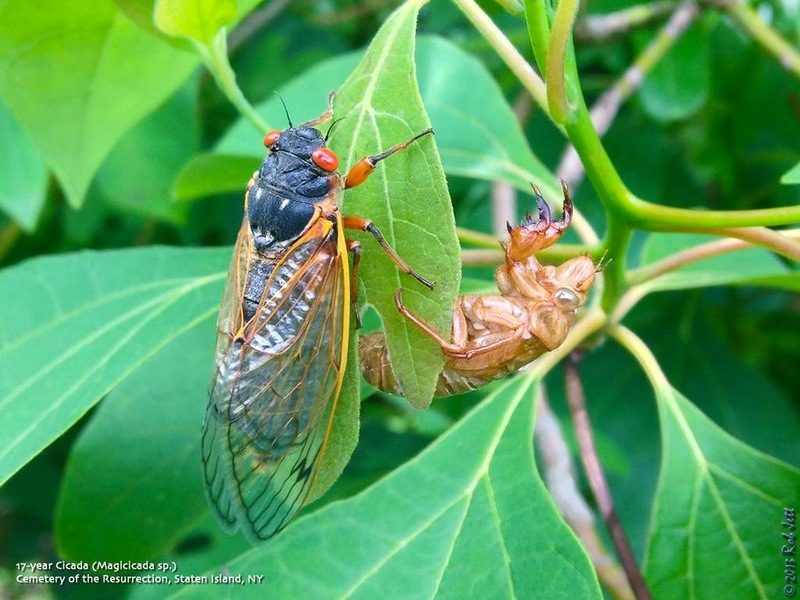 With the 17-year cicadas now out in numbers in many areas, especially along the Hudson River, the added benefit has been the presence of kites in the area. Last Saturday a SWALLOW-TAILED KITE was seen and nicely photographed as it hunted cicadas over the state line overlook, one of the river vantage points off the Palisades Parkway. This site, off Exit 3, is in New Jersey, just a mile south of the New York line. Unfortunately, the SWALLOW-TAILED continued to move south, rather than up into New York, but the numerous cicadas along the Hudson could attract another one. 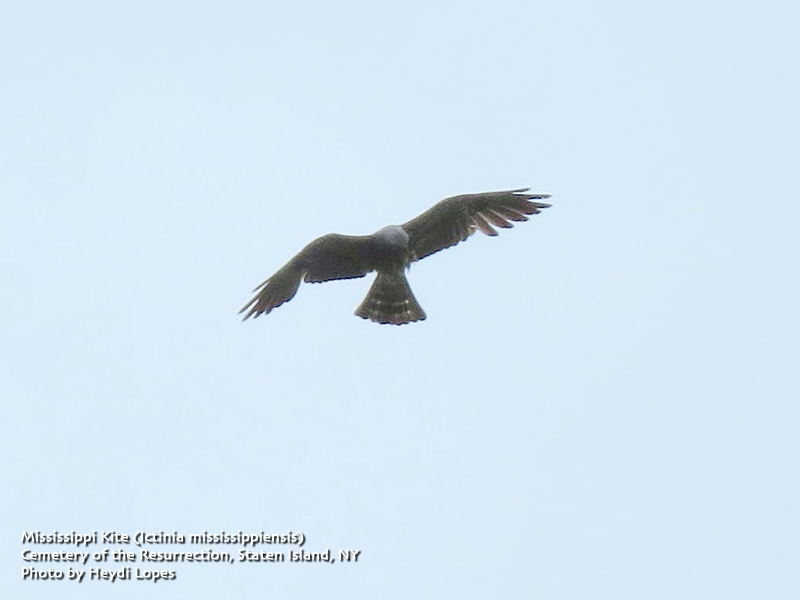 The subadult MISSISSIPPI KITE on Staten Island was still being seen sporadically as it feeds on cicadas over the woods at the Cemetery of the Resurrection, through today, though a patient vigil may be needed. The entrance to the cemetery is off Sharrott Avenue, just north of Hylan Boulevard. Watch especially over the tree line along the western border of the cemetery. Another current highlight locally has been the number of ARCTIC TERNS reported, especially on the mudflats at Cupsogue County Park in West Hampton Dunes. Last Saturday at least six different individuals in varying plumages from first summer to adult were photographed out there, and almost the same number was present on Sunday, with the week also producing a few individuals. Other terns there have included a BLACK TERN or two, a few ROSEATE TERNS and FORSTER'S TERNS, some LEAST TERNS and BLACK SKIMMERS, and numerous COMMON TERNS, while nearby Pike's Beach, just to the east, added the season's first two ROYAL TERNS on Tuesday. Shorebirds there have been somewhat low in numbers, but featured two good highlights: first, a BLACK-NECKED STILT flying west over the Cupsogue flats Tuesday afternoon, and then a RED-NECKED PHALAROPE appearing along the east side of the big sand spit in the bay on the east side of Pike's Beach on Thursday, and still in that area today. Watching for offshore pelagics from Cupsogue was also rewarding Saturday morning, with a dozen or so CORY'S SHEARWATERS and several WILSON'S STORM-PETRELS seen early and a PARASITIC JAEGER appearing somewhat later. 15+ CORY'S were also off Shinnecock Inlet Saturday afternoon, and over 50 CORY'S were counted off Cupsogue on Sunday, with others during the week. Another immature ARCTIC TERN has been reported during the week at Nickerson Beach off Lido Boulevard, west of Point Lookout, where BLACK TERN, GULL-BILLED TERN, and ROSEATE TERN have also been noted around the tern and skimmer colonies. A LEAST BITTERN was spotted at the Lido Beach Marine Conservation Area just east of Nickerson Beach today. Two GULL-BILLED TERNS have recently been south of the West Pond at Jamaica Bay Wildlife Refuge, where the breach still exists. Please express your concerns about this at the Front Desk, as this breach needs to be filled up. An AMERICAN WHITE PELICAN was present in Stony Brook Harbor last Sunday. 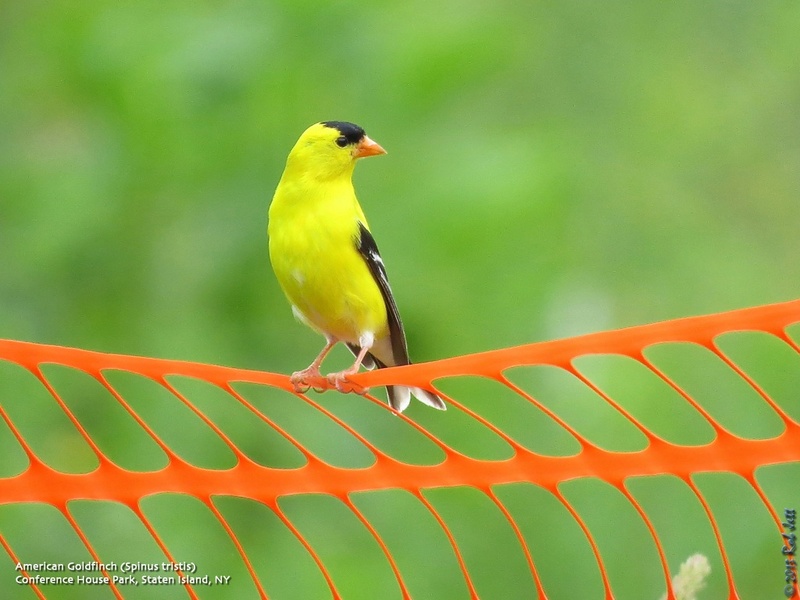 YELLOW-THROATED WARBER continues at Connetquot River State Park, where they are likely nesting, and a young male BLUE GROSBEAK was also spotted there on Wednesday. RED-HEADED WOODPECKERS were noted at the Bronx Zoo Park on Wednesday and in Alley Pond Park in Queens on Thursday. A fishing boat that went out about 85 miles southeast of Shinnecock last Saturday produced 11 CORY'S SHEARWATERS, 28 GREAT SHEARWATERS, 42 SOOTY SHEARWATERS, 4 MANX SHEARWATERS, 145 WILSON'S STORM-PETRELS, 4 LEACH'S STORM-PETRELS, and 2 POMARINE JAEGERS. The LEACH'S were at the farthest extent of the voyage. As Spring migration ends and local breeding birds busy themselves with raising their broods, many birdwatchers turn their attention to the seasonally increasing diversity of butterflies. 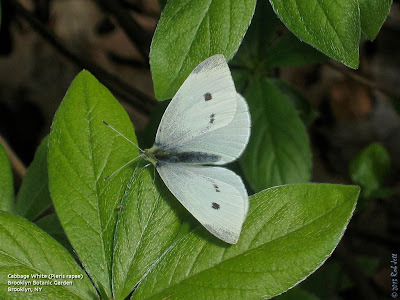 While overlooked by most people (probably because of its lack of vibrant colors), the Cabbage White is one of our most abundant species. Since they fly from late February to mid-November, they are one of the first butterflies to be seen in the Spring and last in the Autumn. They can be found in a variety of habitats. This European species was accidentally introduced to North America. Extreme weather and a decrease in a primary food source threatens monarchs. The percentage of forest occupied by monarch butterflies in Mexico, used as an indicator of the number of butterflies that arrive to that country each winter, reached its lowest level in two decades. According to a survey carried out during the 2012-2013 winter season by the WWF-Telcel Alliance, and Mexico’s National Commission of Protected Areas (CONAP), the nine hibernating colonies occupy a total area of 2.94 acres of forest—representing a 59% decrease from the 2011-2012 survey of 7.14 acres. The latest decrease in monarch butterflies is likely due to a decrease in the milkweed plant (Asclepias)—a primary food for monarchs—from herbicide use in the butterfly’s reproductive and feeding grounds in the US, as well as extreme climate variations during the fall and summer affecting butterfly reproduction. “The conservation of monarch butterflies is a responsibility shared by Mexico, the US and Canada. By protecting its sanctuaries and practically eliminating large-scale deforestation, Mexico is doing its part. It is necessary that the US and Canada also do their part and protect the habitat of the monarch in their countries,” Vidal addedWWF-Telcel Alliance, for the last 10 years has supported conservation and sustainable management of natural resources in Mexico, along with the well-being of the people who depend on those resources. WWF projects include the development of sustainable business—such as tree nurseries, mushroom production modules and art craft production—and support for sustainable tourism. 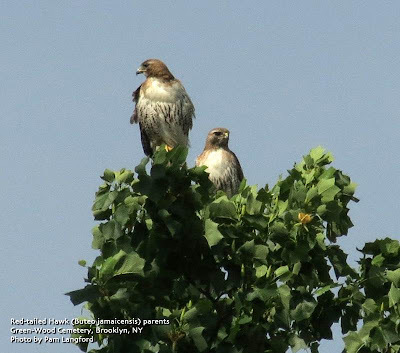 I just returned to NYC from a long weekend in Atlanta and missed the maiden flights of our local Red-tailed Hawk youngsters. Both Ann and Pam sent me an update on Friday. I thought you'd like to know, the single Red-Tail in the rickety-pickety nest tree on [Brooklyn Museum] property fledged yesterday and was hopping from one tree to another after a long preening spell on the dead pine tree near by. Looks like she is doing the "branching" that there was no room to do on the nest. She is still on the [Brooklyn Museum] side, but at least she is staying in the trees so far. She looks relaxed and spent a lot of time preening. PS - I did not see the fledge, but she was in the nest tree the night before, so yesterday had to be the day. I watched the Green-Wood fledgling for a while today. He was near the nest, and in fact flew to the nest tree almost as soon as I found him. He looked good but was quite awkward trying to get to the nest after he landed in the tree. Mom and dad were around in their usual lookout spots. 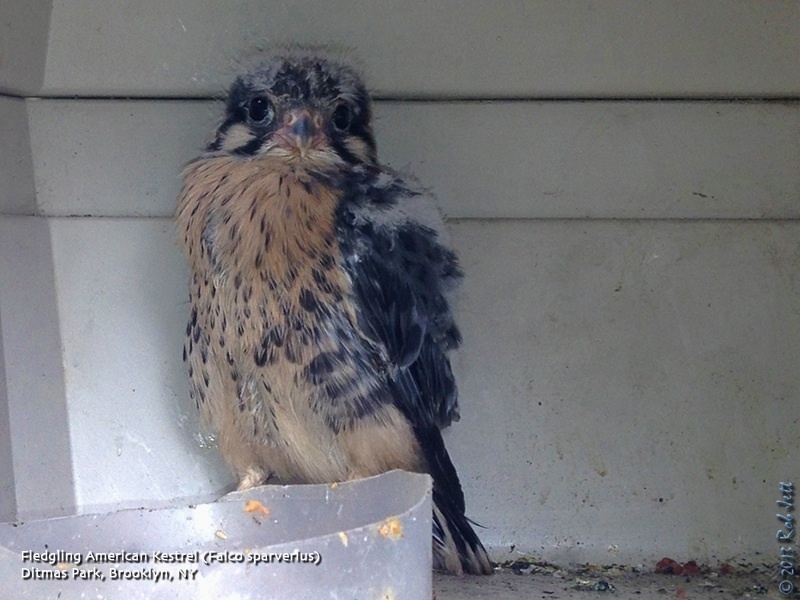 The Brooklyn Botanic Garden baby fledged yesterday. Today he was in a tree close to the nest, and mom appeared to be trying to lure him with food. He was having none of it. The peregrines at the House of Detention on Atlantic Ave. have been lively and so much fun lately. I caught one on a building roof today. Hope to see both of you at one nest or another! Focus: breeding plovers, terns, and oystercatchers. Note: Pre-dawn departure. Bring lunch, tripod, and your longest lens. Sunday, June 23, 2013, 5-8pm. Meet at Pier 4 in Sheepshead Bay, Brooklyn. Enjoy a three-hour narrated cruise aboard the 100-foot boat “Golden Sunshine.” Visit backwater marshes near JFK Airport, and learn about the 13,000-acre Jamaica Bay Wildlife Refuge. 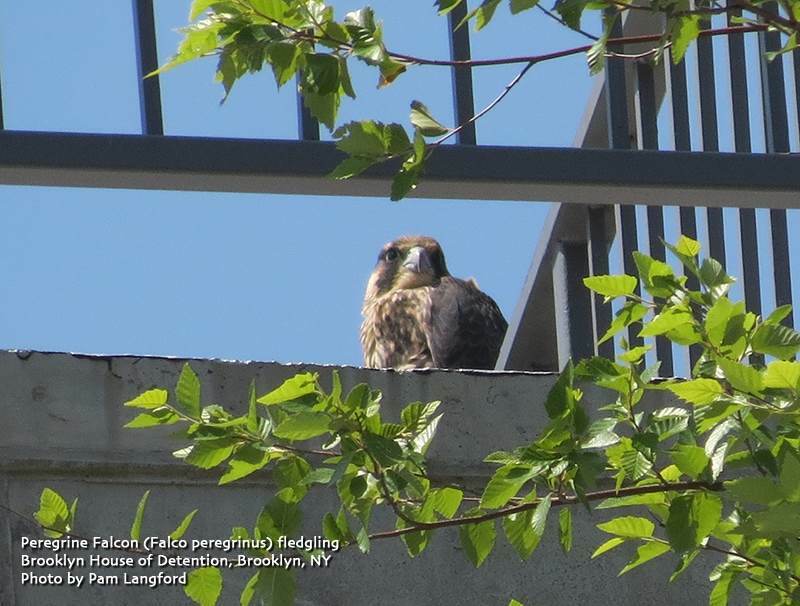 See nesting peregrine falcons, ospreys, egrets, shorebirds, and waterfowl. Includes refreshments. Guide: Gabriel Willow, Eric Lind With Constitution Marsh Audubon Sanctuary Join two expert naturalists, our own Gabriel Willow and Constitution Marsh's Eric Lind, to explore Constitution Marsh Audubon Sanctuary--a spectacular 271-acre tidal marsh just outside of Cold Spring, NY. Observe marsh birds up close as you paddle through this pristine fresh water habitat by canoe--possible sightings include Virginia rails, spotted sandpipers, and Louisiana waterthrushes, as well as bald eagles. Then look for warblers and other spring migrants on the sanctuary's trails. Finally, enjoy a picnic lunch while learning more about the marsh's ecology, including its feathered residents. Bring binoculars, water, lunch (plus clothes and shoes you don't mind getting wet). Transport by passenger van included. Limited to 13. $90. Guides: Don Riepe, Mickey Cohen With American Littoral Society Meet at Pier 2 in Sheepshead Bay, Brooklyn. Enjoy a three-hour narrated cruise aboard the 100-foot boat “Golden Sunshine.” Visit backwater marshes near JFK Airport, and learn about the 13,000-acre Jamaica Bay Wildlife Refuge. 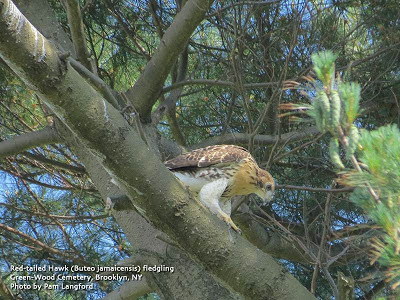 See nesting peregrine falcons, ospreys, egrets, shorebirds, and waterfowl. Includes refreshments. Join herbalist Gert Coleman for a walk through the paths and gardens at Conference House Park to identify both wild and cultivated medicinal plants. Meet in the parking lot at the end of Hylan Boulevard. Call 718-356-9235 or email gert.coleman@verizon.net for more information. Sunday, June 23, 2013, 10:30 a.m. to 2:30 p.m.
We’ll walk 4.3 moderate miles starting and ending at the Greenbelt Nature Center, with lunch at High Rock. This walk includes a gradual climb up Moses’ Mountain. Bring ample water and lunch. Wear a long-sleeved shirt, comfortable pants and a hat. Shorts are not recommended. Meet at 10:30 a.m. sharp at the Greenbelt Nature Center on Rockland Avenue and Brielle Avenue. Rain postpones the event to the same time on June 30. For more information, email Hillel Lofaso at hillel5757@gmail.com or call 718-477-0545. Explore the Back Woods of Fort Tilden and discover historic war secrets. Enjoy the night as a ranger guides you along the West Pond Trail on a full moon night. American Goldfinches are a fixture at bird feeders around Brooklyn in the Winter months. Their mostly olive non-breeding plumage during that period isn't nearly as impressive as this brilliant breeding male that I spotted on Staten Island last Saturday. It is the only finch that undergoes a complete molt twice a year. While researching facts about this species I noticed that the scientific name has been changed twice. It was originally described by Carl Linnaeus in 1758 and included in the genus Spinus with the name "Spinus tristis" (New World goldfinches and siskins). Then in 1976, Spinus was merged into the genus Carduelis, renaming the American Goldfinch "Carduelis tristis". At some point subsequent to that the American Ornithologists’ Union appears to have had a change of heart and returned the American Goldfinch to "Spinus tristis". A goldfinch by any other name is just as lovely. It's been about a week since I last checked on the hummingbird nest in Prospect Park. The last time I was there Momma Ruby-throated was still sitting on the nest. This morning the nest appeared to be empty. I waited around for about 20 minutes and didn't see any activity in or around the nest. Either the young fledged already or the nest failed. If anyone observed nestlings within the past week please let me know. Last year's nest near the Vale of Cashmere still had two fat youngsters on June 18th. I went to the Cemetery of the Resurrection on Staten Island with a couple of friends over the weekend to look for a reported Mississippi Kite. We found the kite as soon as we exited the car, but then became completely transfixed by the millions of 17-year cicadas that have emerged around the South end of Staten Island. Mississippi Kites are a rare Southern visitor that seem to be showing up around the tri-state area more frequently in recent years. On Friday, local birding wunderkind Anthony Ciancimino (15 years old!) spotted one at the Cemetery of Resurrection. I suppose New York City birdwatchers shouldn't have been too surprised. 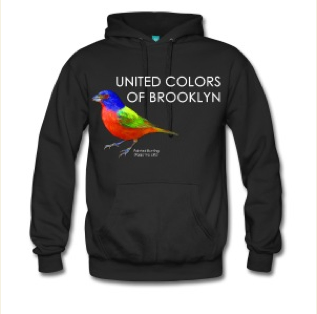 First, Anthony has developed a reputation for finding really good birds on Staten Island in his brief birding career. Second, some folks had predicted they might show up because the first Mississippi Kite record in New York State was during a 17-year cicada emergence. I've looked for this raptor on trips to Florida in the past, but never managed to see one. When Heydi's friend Lisa offered to drive to Staten Island on Saturday, how could I say no. Heydi and I had been birding at Floyd Bennett Field since around 7:30am. The bird activity was disappointing only in that we didn't manage to find anything new or unusual. We both had been hoping that a Mississippi Kite would find Brooklyn inviting. I guess not. There were a lot of breeding birds around and while walking the edges of all the runways probably heard or saw 20 species, including three different warblers. Anyway, Lisa picked us up there at around 11am and we headed towards the Verrazano Bridge. Lisa drove a route that took us through central Staten Island's "Greenbelt". That was were we first heard it - the constant, low, drone of the magicicadas that have emerged on the island. All three of us are nature-nerds and were very excited about our first mass cicada experience. I wanted to jump out of the car at the first traffic light to photograph a swarm at the side of the road, but Lisa assured me that there would be plenty of time for that later. We continued to the cemetery. I had only been to the Cemetery of the Resurrection once, for my wife's Uncle Billy's funeral several years ago, so knew of it, but didn't know my way around. However, it only took a few minutes for us to spot three people with binoculars. We knew we were in the right place. One was local birder/naturalist Seth Wollney. We hadn't seen each other for a while and, moments after exchanging pleasantries, he pointed skyward and said, "Looking for the kite?" There it was. That was way too easy. 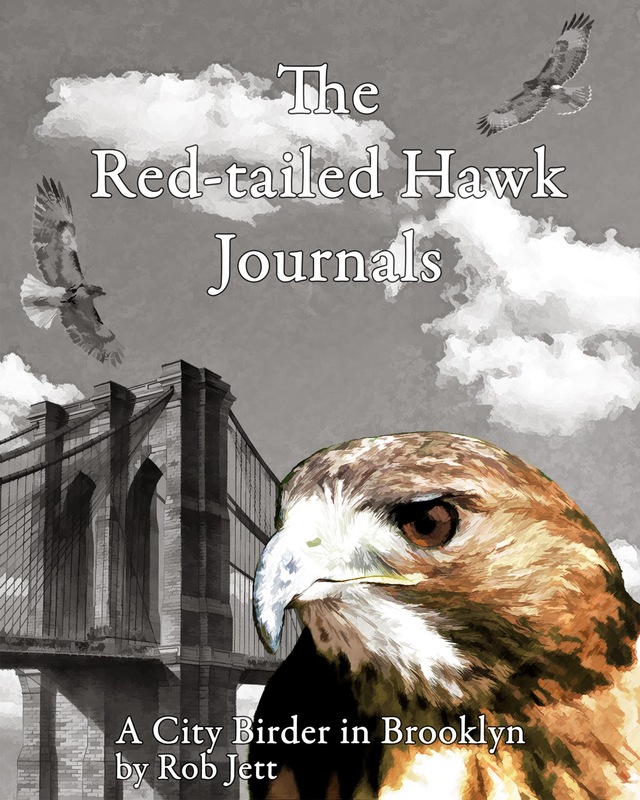 The pale gray raptor was slowly soaring back and forth over the cemetery. At one point it perched at the top of a tree next to a service in progress. It seemed highly inappropriate for us to go running through a gathering of grieving family members with cameras and binoculars dangling from out necks, so instead we waited for the kite to take flight again. Which it eventually did. We made assorted laughs and cheers when it snatched a cicada out of the air and began eating it on the wing. As it drifted out of sight to the South, we concentrated our interests on a much smaller winged creature. The plants life at the edge of the field was dominated by oaks, sassafras, Autumn Olive and Black Cherry trees. The cicadas didn't seem to have a plant preference and perched on or flew in and out of all of them. Some even perched on mugwort and other small, weedy plants nearly at ground level. The collective sound of these creatures was not what I had expected. Negative reports in the media led me to believe it would be a nightmarish, high-decibel hiss. In reality, it was a relatively low-frequency hum. More like a drone. Seth has been studying the magicicada and pointed out to me that there are actually three species emerging on Staten Island. They are very similar, but can be separated by their distinctive shape and color, songs and behavior. They are Magicicada septendecim, Magicicada cassini and Magicicada septendecula. Once Seth began describing the different songs, I was able to pinpoint some of the variations in the unwavering bubble of drone we seemed to be immersed in. Check out the Magicicada cassini song here. 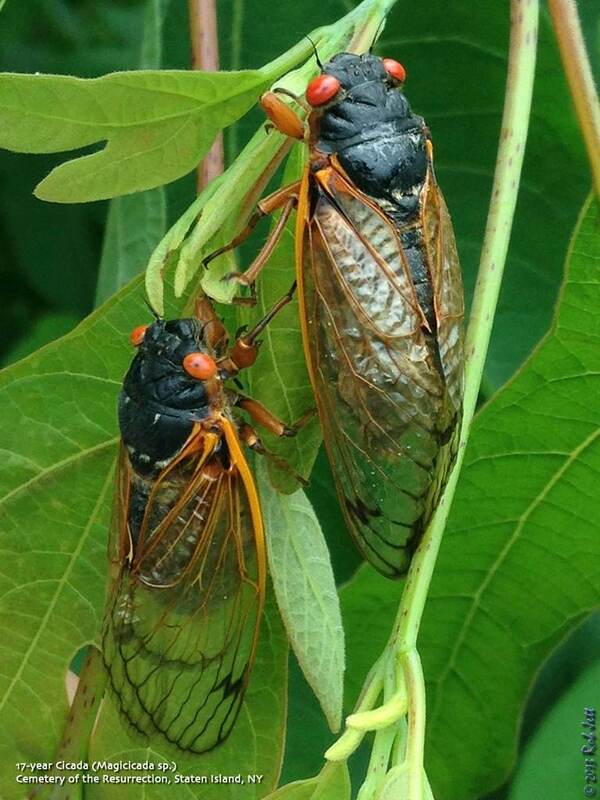 17-year cicadas are harmless to humans and, apparently, to most plants. You can read an FAQ about these intriguing insects here. After about 30 minutes of fun with the kite and cicadas, Lisa, Heydi and I headed across Hyland Boulevard to Mt. Loretto Unique Area. Tom Preston sent out a text earlier that there was a Blue Grosbeak at that park's grassland habitat. We decided to go look for it. We parked the car at the main lot on Kenny Road and walked West along the North path through a field of tall grass and wildflowers towards Cunningham Road. The head of a young buck White-Tailed Deer with a lopsided, single set of antlers stuck up from the grass to our left. He watch nervously as we passed within several yards, then slowly ambled deeper into the grassland. A second buck appeared out of the field of green and followed closely behind him. We caught up with Tom and Isaac, who were standing next to a newly formed pond at the edge of the road. It had rained so much overnight that there were several new bodies of water in depressions throughout the expansive grassy habitat. Mallards, of course, had claimed all of them. We stood around talking with Tom and Isaac for several minutes, occasionally scanning the tops of the grass and wildflowers for Blue Grosbeak. Apparently both a male and female had been spotted, the female with nesting material. Eventually Isaac caught a glimpse of the male when it flew up into a nearby oak tree. We listened to its clear, sweet, musical warble for a minute or two before we all finally got on the bird. It flew across to the Western edge of the field where it perched high up for a moment before diving down into the understory, possibly to help his mate with nest building. Some other species seen while at Mt. Loretto were Black Vulture, Eastern Wood-Pewee, Bank Swallow, Yellow Warbler, Indigo Bunting and Orchard Oriole. Black Vulture are not typically seen around Staten Island but have begun to breed locally over the last few years. Before leaving Staten Island we made one last stop at the Southern-most tip at Conference House Park. Seth told us earlier that the magicicada activity was even more impressive (and loud) at that location. He wasn't exaggerating. Not only was the sound louder here, but I assume that this was where Brood II had emerged first because many were already beginning to die off. The walking paths through the park were littered with dead or dying cicadas. Birds were feasting on the sudden windfall of food. I wondered how it would affect local breeding bird populations this year. Would they have more or larger broods? Seeing a Mississippi Kite in New York City was definitely a rare treat, but I highly recommend checking out the cicada explosion before it's too late. There's always a possibility that a vagrant kite will pass through New York over the next few years, but you won't be able to experience the magicicadas again until 2030. Check out more pictures and videos at Corey's posting on "10,000 Birds" and Andrew's posting at "The Birding Dude". From the World Bank: "Sustainable Energy for All - What Will It Take?" Guide: Joe Giunta, Happy Warblers LLC Look for breeding American bitterns, cerulean, hooded, and golden-winged warblers, and more at these three great birding areas. An overnight stay will facilitate being in the right spot at the right time. Bring lunch for the first day, binoculars, and a spotting scope (if you have one). Guide: Gabriel Willow With Green-Wood Cemetery Meet at the cemetery entrance at 5th Ave and 25th St., Park Slope, Brooklyn. While it might seem an odd place to go birding, Green-Wood Cemetery is rich in both history and wildlife. It is also the highest point in Brooklyn, affording marvelous views. We will explore its environs in search of spring migrants and its most unique avian residents: the huge flocks of brilliant green monk parakeets that nest there. Native to South America, these charming immigrants are surprisingly hardy and flourish even in our harsh winters. Saturday, June 15, 2013, 10:00 a.m. to 2:00 p.m.
Meet at the back of the LaTourette Golf Course parking lot on Richmond Hill Road (close to the Edinboro Road entrance). We will walk the Red trail removing invasive vines that strangle or pull down shrubs and saplings. If you don’t have your own, Protectors will supply pruners, gloves and refreshments. After a two-hour work session (our 203rd monthly workshop), we will take a short walk over nearby trails. Saturday, June 15, 2013, 11:00 a.m. to 12:30 p.m.
Dr. Alan Benimoff will lead a 1.5-hour walk highlighting the igneous rocks found here that formed 200 million years ago as the supercontinent Pangaea split apart. You will see a very rare example of a xenoilth that partially melted to form a trondhjemite. Dr. Benimoff will also show evidence that a glacier flowed over this area around 22,000 years ago. Meet in front of the park sign on the south side of Forest Avenue between Van Name Avenue and Simonson Avenue. There is also a scheduled clean-up of the park that starts at 10 a.m. Call Dr. Benimoff at 718-477-1974. Sunday, June 16, 2013, 10:30 a.m. to 12:30 p.m.
Join naturalist Seth Wollney as he explores the beauty of High Rock Park. Participants will be searching for late migrants, nesting birds, turtles and other wildlife as we make our way toward Pouch Camp. After climbing a moderate slope, participants will view Pouch Camp from within High Rock and discuss Protectors’ role on the Committee to Save Pouch Camp and our effort to preserve the woodlands and scouting programs that take place on the property. Meet in the parking lot atop Nevada Avenue just inside High Rock Park. Call Seth Wollney at 718-619-5905. Sunday, June 16, 2013, noon to 2:00 p.m. Discover this hidden natural park in Dongan Hills. Participants will visit the three bodies of water in the park and hike through the woodland slopes. Although none of the willows grown by the Reed family still exist, the woodlands and stream are still home to a wide variety of flora and fauna. Meet at the park entrance atop of Spring Street in Dongan Hills. Sunday, June 16, 2013, 2:00 p.m. to 4:00 p.m.
Join naturalist Mike Shanley and explore Great Kills Park in summer. We will be exploring the shoreline and searching for birds, butterflies and other wildlife as we make our way out to Crooke’s Point. We will be meeting at the first beach parking lot across the street from the ranger station. Bring lunch A great place with many breeding birds, dragonflies galore, and rare flora. Last spring, Mississippi Kites nested right at the visitor's center. Walk through Buck’s Hollow, where in 1979 and 1996 all three periodical cicada species were found. Calling all citizen scientists to count periodical cicadas during this year’s Brood II emergence. Enjoy a walk around the refuge as we seek out some of the sights and sounds of summer. Greetings. This is the New York Rare Bird Alert for Friday, June 7th 2013 at 7pm. The highlights of today's tape are MISSISSIPPI KITE, ARCTIC TERN, RED-NECKED PHALAROPE, CATTLE EGRET, SUMMER TANAGER, YELLOW-THROATED WARBLER and late Spring migrants. As hoped for in this year of the 17 year cicada a couple of MISSISSIPPI KITES have appeared this week nicely timed with the local emergence of the cicadas. 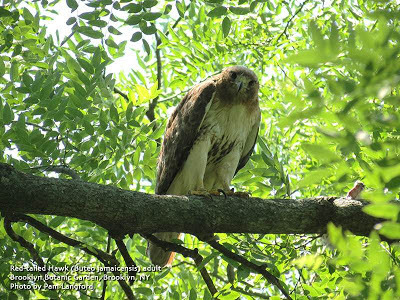 A KITE visited central Putnam County east of the Hudson River last Sunday just as colonies of cicadas were emerging at various sites along the Hudson Valley and then yesterday a MISSISSIPPI KITE was spotted on Staten Island spending the morning hours around the Cemetery of the Resurrection. This site is off Sharrott Avenue just north of its intersection with Hylan Boulevard just east of the Mount Loretto Unique Area. Two cicada emergences ago back in 1979 2 MISSISSIPPI KITES spent a week or more on Staten Island for the first New York State record. Out at Cupsogue County Park in Westhampton Dunes another adult like ARCTIC TERN visited the flats north of the parking lot last Saturday when a "Western" WILLET appeared among the shorebirds gathering there and at nearby Pike's Beach. A few ROSEATE TERNS can usually be found among the terns loafing on the Cupsogue flats and a BLACK TERN was spotted there on Sunday. Additional ARCTIC TERN reports include an immature Wednesday and an adult type on Thursday. Offshore pelagics only featured a few SOOTY SHEARWATERS during the past week but this storm could bring more. A female RED-NECKED PHALAROPE was noted at Shinnecock Inlet last Saturday. Two CATTLE EGRETS, perhaps post-breeding dispersals from more southerly colonies, appeared locally this week with one seen Tuesday around Gerritsen's Creek at Marine Park in Brooklyn. Another was spotted Tuesday off David White's Lane in Southampton. This individual possibly the one seen Wednesday at a traditionally reliable site for CATTLE EGRET in Bridgehampton this at the Mecox Dairy around the intersection of Halsey Lane and Mecox Road. Otherwise, Spring migration, somewhat disappointing this year has reached its final stage with the anticipated late migrants for the most part continuing to move through. Late May to early June usually produces decent numbers of empidonax flycatchers and ACADIAN FLYCATCHER, ALDER FLYCATCHER and YELLOW-BELLIED FLYCATCHER have all been reported from Central Park this week. MOURNING WARBLER, the most sought after of the late warblers, has also appeared at several locations as have some cuckoos mostly YELLOW-BILLED CUCKOO and GRAY-CHEEKED THRUSH. An adult RED-HEADED WOODPECKER remained around the Central Park Ramble at least to Monday. Other notable sightings featured a male SUMMER TANAGER near the waterhole in Forest Park on Tuesday and a continuing territorial YELLOW-THROATED WARBLER near the entrance to Connetquot River State Park. As a potential nester the latter bird of course should not be harassed with tape recordings. In Westchester a BLUE GROSBEAK and a singing NELSON'S SPARROW were at Marshlands Conservancy in Rye on Wednesday. 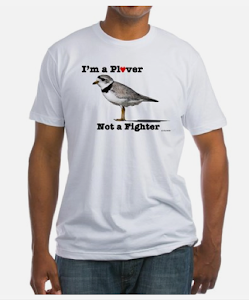 What is an Empidonax Flycatcher?? In general, all of these birds are relatively small, with an olive upper body, white and yellowish undersides and varying thickness eyering. They all chase flies. I searched around for the etymology of the word "empidonax" and found two, comparable definitions. The "Scienceblog" website claims that in Latin it means "Mosquito King". "The Federation of Alberta Naturalists Field Guide to Alberta Birds" (by William Bruce McGillivray, Semenchuk, Glen Peter) says it means "King of the Gnats". Either one tells me that we humans owe these birds a huge debt of gratitude. "Many birders know that Empidonax flycatchers differ significantly with respect to wing and tail measurements ("morphometrics"). But how do these morphometric statistics translate into useful impressions in the field? The Acadian Flycatcher provides a good example of the approach implied by this question. 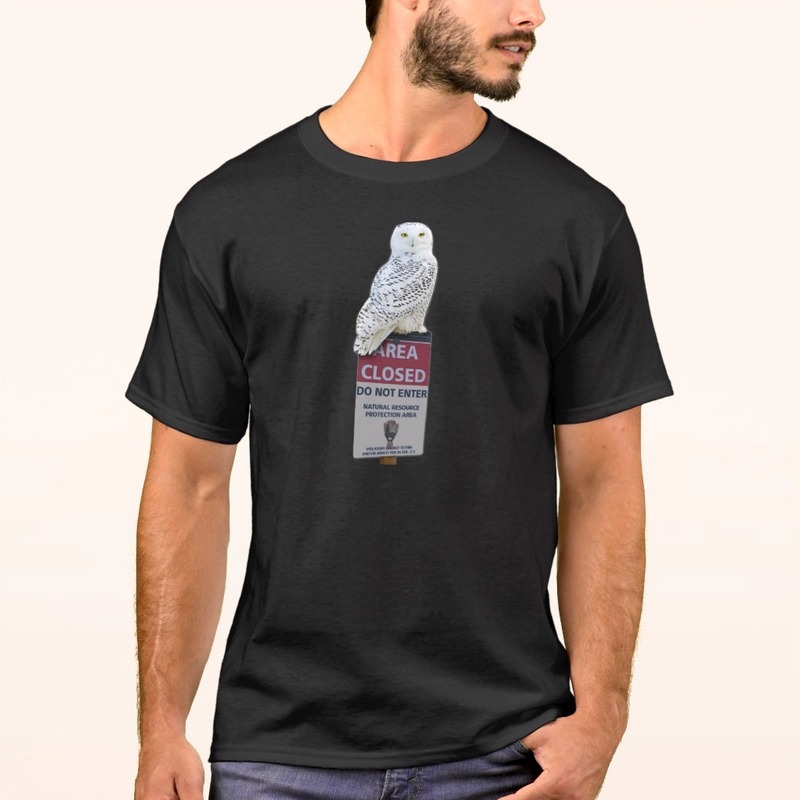 Even if you do not consciously detect the long primary projection and long bill, note how these characters translate into sword-shaped wing tips and a long, sloping forehead with a hint of a crest." Whew, sounds intimidating. You can download the entire article as a PDF file here. This is the time of year around New York City when a lot of American Kestrels begin to venture out of their nests ... ready or not. Bobby and Cathy Horvath (as well as, all the local wildlife rescuers) end up with calls from concerned New Yorkers having found one or more of these tiny falcons wandering around on the ground. This young male was picked up by a guy named John in Ditmas Park when he spotted it in front of his house. Cathy called me to go check it out and report back to her. The little guy seemed fine, just a bit too young to fend for himself. I'll keep you posted with updates and when he'll be released back to the wild. It shouldn't be a surprise that the month of May saw my greatest increase in year species. Despite weather conditions that created a shortened migration season with spotty periods of North-bound migrants around New York City, I managed to add 48 new species, bringing my Brooklyn total for this year to 216. Most birders, myself included, were really concerned by the delayed migration and dominant North winds. 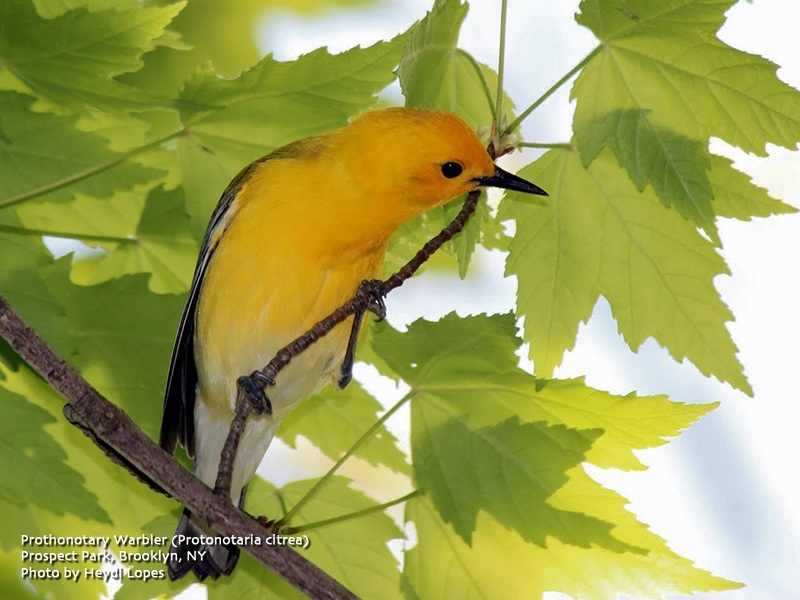 I did, however, have a seemingly auspicious start to the month when a Prothonotary Warbler dropped in on Prospect Park. This brilliant, golden-yellow warbler's breeding range is South of NYC, but a few yearly overshoots tend to appear around the five boroughs early in May. This cooperative individual spent the day foraging around the edges of Prospect Lake and was ultimately seen by a couple of dozen lucky birders. During the second weekend of May I tallied my highest number of new species for the year - 18. I was able to pick up a bunch of shorebirds that Saturday when thunderstorms forced down a nice sized flock onto the runways at Floyd Bennett Field. I wrote about that weekend here. The highlight of the month occurred right after I returned from a trip to New Orleans. Flycatchers had apparently begun moving through the area and I received a text from Shane that there was an Alder Flycatcher in Prospect Park. This bird breeds in New York State and isn't particularly rare, yet I'd never managed to see one anywhere within the city's five boroughs. My mother used to live upstate in the Catskills and, when I'd visit in the Summer, would hear this flycatcher's harsh, buzzy "fee-bee-o" call virtually all day long. I hopped on my bike and pedaled into Prospect Park and up Lookout Hill hoping to hear the alder. Turns out there were actually two birds present, one down the hill, near the Maryland Monument and one at the top of the hill, near the Butterfly Meadow. So, after not finding a single Alder Flycatcher in Brooklyn in over 20 years, I was sitting on top of Lookout Hill listening to a pair in a distant duet. I sent out a tweet and Keir showed up less than 5 minutes later, looking for his first Brooklyn Alder Flycatcher. I was happy to help him find it, which only took a few minutes.